The subcontractor responsible for faulty bolts on London’s Cheesegrater skyscraper has run into trouble again on another high-profile London scheme - this time the new £650 million US embassy in Vauxhall. 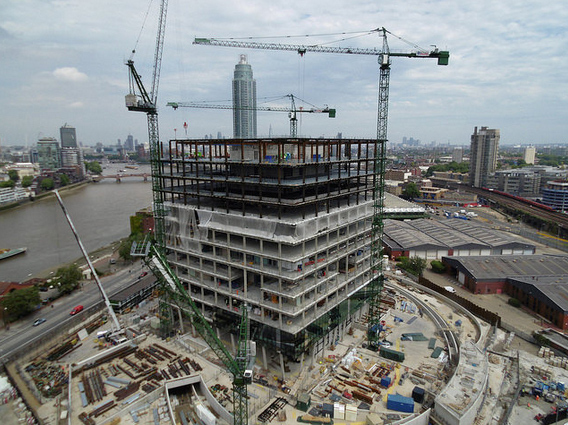 Steel specialist Severfield now has to replace a number of bolts on Kieran Timberlake’s £650million US Embassy project in Nine Elms, after installing the wrong ones. Steelwork firm Severfield took a £6 million hit on the Cheesegrater, also known as the Leadenhall building, in results last month after some of the bolts broke away from the structure. Since the original problems occurred at the Cheesegrater in November 2014 World Architecture News has repeatedly asked what steps were being taken to ensure that this incident could not occur again on a similar project. Now it is understood that the firm is having to replace thousands of bolts on the top four floors of the new US embassy. The news comes nine months after three out of the 3,000 ‘mega-bolts’ fitted by Severfield on the Leadenhall Building fractured, with part of one falling to the ground. The bolts on the upper floors of the highly sensitive construction project were US-made and supplied by the American main contractor on the job, BL Harbert, which is working with UK builder Sir Robert McAlpine, but their replacement is set to delay concreting work on the top floors of the building. Sources said the replacement of the bolts is unlikely to wreak the financial havoc that the Cheesegrater caused to Severfield’s results, despite fresh embarrassment to chief executive Ian Lawson. Even before the latest £6 million bill, cost overruns on the skyscraper and other projects forced the sacking of the previous chief executive and an emergency rights issue to shore up Severfield’s balance sheet in 2013. Sir Robert McAlpine confirmed some bolts are being replaced although it added that “this does not affect the overall project schedule at all”. The project will see the US embassy relocated from its home of 50 years in Grosvenor Square to the new site in the London borough of Wandsworth. The 12-storey building will house 1,000 staff and cover 45,000 sq m.